Kaleidoscope is an urban intervention that takes on a global, largely secular perspective of seasonal design. This exhibition is an annual Christmas event centring around ideas of inclusiveness, equality and festival place making. Installations occur simultaneously across the city, many in busy outdoor locations. 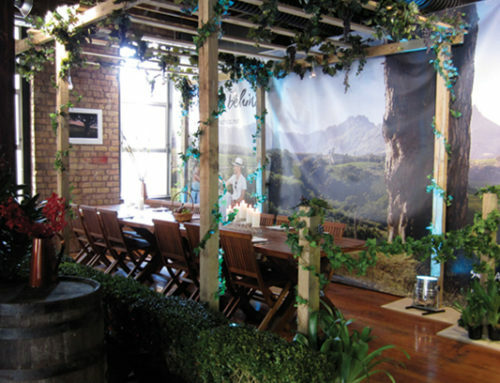 The work was designed to provide a place for celebration of the season, re-engage the community in the city and revitalise the retail precincts. These events are attended by a diverse gathering of public ranging in different ages, races, genders and multicultural backgrounds. The design response is sensitised towards the many challenging ethical, cultural and socio-economic implications the Christmas season presents. For example – celebration of a northern hemisphere winter light festival in midsummer in Australia, the evolving globalisation and glocalisation of the festival, negative associations with consumerism and kitsch design, secular vs non-secular belief systems and sustainability considerations. The concept identity was designed by Sydney design studio, Boccalatte. 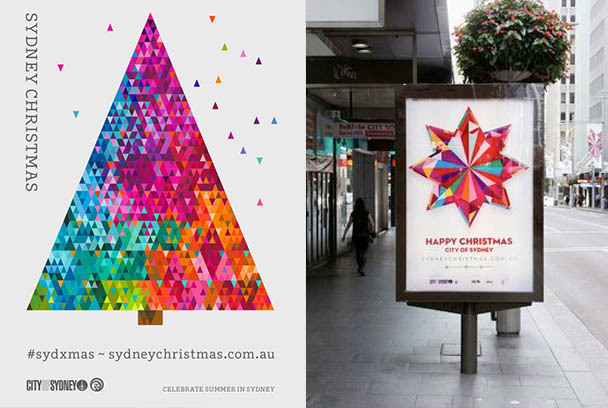 It focuses on the celebratory notions of Christmas whist still taking into consideration the diversity of the people of Sydney. Obvious religious overtones and clichéd iconography were avoided. The concept combines the symbolism of stained glass with a carefully selected colour pallet that reflects the natural beauty of Sydney. These facets of colour are united into subtle abstractions of Christmas forms such as geometric stars, snowflakes or trees to suggest a sense of unity and connectedness that is created by a colourful spectrum of individual parts. The spatial design strategy correlates with the city of Sydney’s strategic ‘City of Villages 2030’ plan dividing the city into different zones or precincts. Key nodes, transit zones and significant landmarks are selected for different design treatments throughout the city. Content and deliverables are then contextualised according to the public usage and demographics of each space. 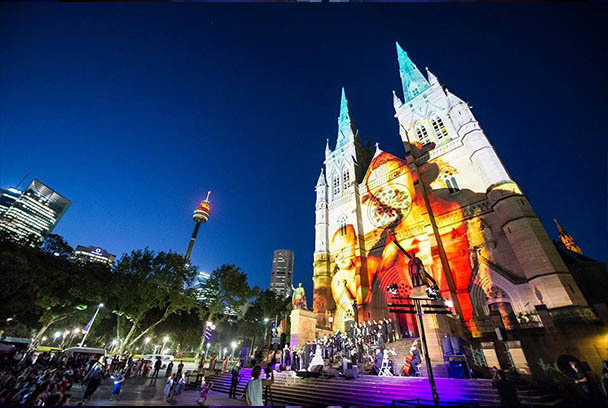 For example, religious iconography is projected onto the main cathedral whereas projection mapped images on the Town hall reflect more a contemporary, secular focus. One of the hero installations is located at Martin place. This point is a congregation zone for multiple Christmas related events, the main highlight being the tree lighting ceremony. The tree design and surrounding decorations integrate nostalgic tradition and contemporary experiential designs. 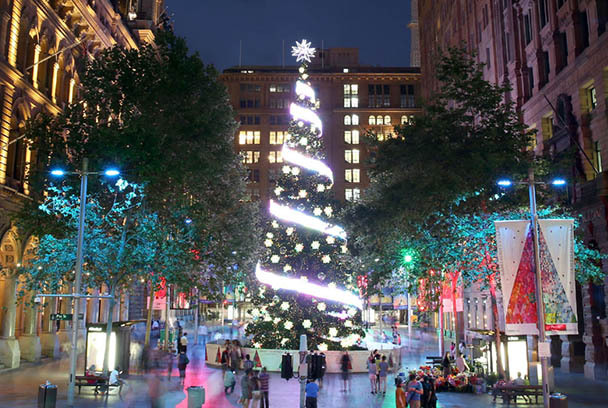 The 21m illuminated traditional foliage Christmas tree is located in the heart of Martin place during the festival. The tree is adorned with faceted ornaments inspired by the festival branding and draped in an interactive LED ribbon. Messages of love and togetherness can be uploaded via social media for all to see. 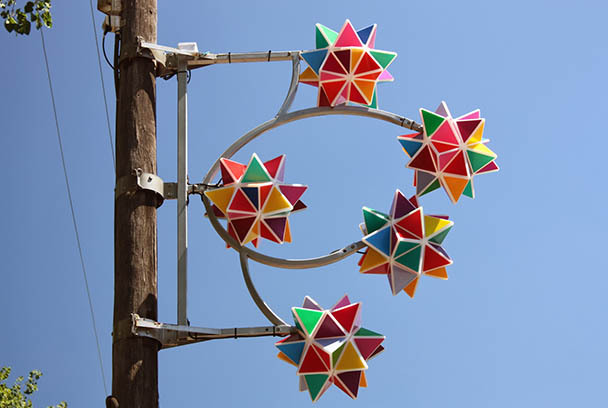 The surrounding smart pole decorations are illuminated abstractions of the southern cross. This design again reflects the duality of the design concept with traditional iconography of the star arranged in a form that responds to Sydney’s Southern hemisphere contextual location. The work demands a high degree of innovative creative development, technical precision and clear design direction to ensure all designs meet cultural, ethical and aesthetic needs along with complying with public safety and sustainability standards. 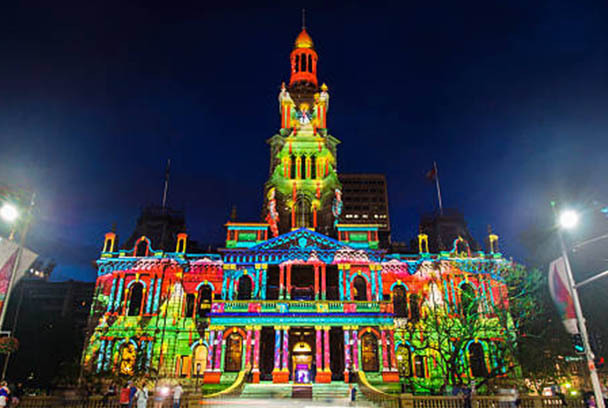 The event is a complex technically challenging installation requiring a high level of design consultation with many different stakeholders including designers, project managers, event managers, riggers, lighting and audio-visual technicians, engineers, installation crew, and representatives of the city of Sydney. Metrics of such wide scale public events are difficult to quantify. Designs from previous years have however received a good share of critical acclaim from event organisers and the general public. Potentially this is due to its sensitive consideration of the many and varying public needs of the festival. 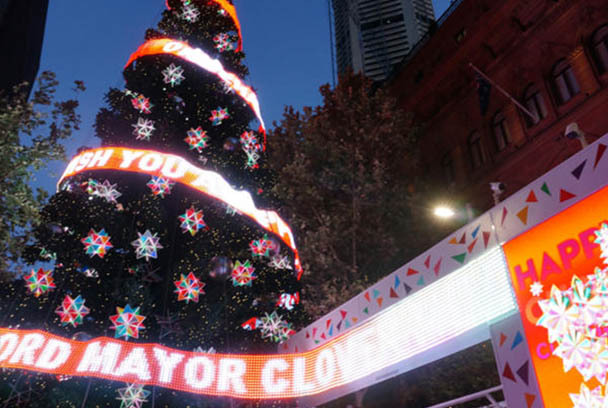 Images and more details of the installations can be viewed on the City of Sydney website https://whatson.cityofsydney.nsw.gov.au/major-events/sydney-christmas .